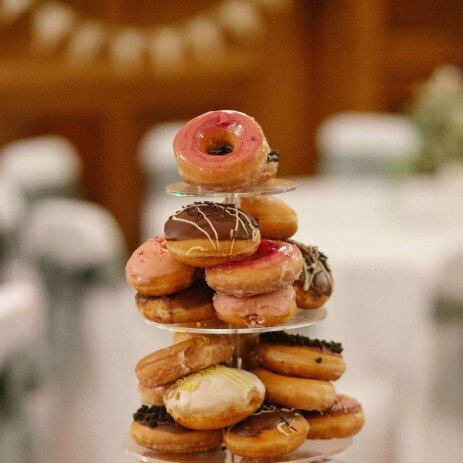 Fill out our simple form and get quotes from local Wedding Donuts suppliers. Donut Wall for hire and bespoke Donut Walls made to order. Freshly baked iced donuts in a variety of flavours. Our Donut Walls really do add that Wow moment to any occasion. Doughnut wall to hire for all occasions. Delivered, set up and collected the next day. Holds 25 or 50 donuts per wall. Beautiful heart design. I provide donut wheels or rustic donut wall. My wheels look great on any sweet table each one holds 24 donuts and they spin without losing a donut. Made from food grade plastics. Hire our donut wall and have your choice of ring donuts either standard or special Krispy Kreme Donuts for that perfect sweet treat. Greggs or Krispy Kreme doughnuts. Our handmade doughnut wall will capture the hearts of your guests with a sweet and sticky treat. Double the doughnuts offer available.